When trying to meditate, sometimes it seems that the slightest noise can take you out of your concentration. You are trying your best to focus on your meditation, but either the neighbor’s barking dog, kids playing in the next room, loud TV shows from the apartment next door, etc., can take you away from your peaceful breathing practice in no time. To help you with this problem I’ve created a list of the best ear plugs for meditation. Yes, ideally you want to be able to concentrate no matter what’s going on the outside world. However, when you are just starting out with your meditation practice it can be quite a challenge. Why struggle, when you can do something practical about it? I remember years ago when I was doing a meditation retreat, at the same time they were also giving some teachings on the top floor where I was doing my retreat. It was really easy for the mind to want to listen to the teachings since they were really interesting, I had to use ear plugs so I could focus on my retreat. Thank you ear plugs for helping me stay focused! dB: stands for Decibels which measure the intensity of sound. A Decibel scale is use for measurements. To give you an idea on this scale the sound of normal breathing is about 10 dB and fireworks is about 145 dB. So the higher the decibel level the louder the noise is. NRR: stands for Noise Reduction Rating. The higher this rating is, the more noise it reduces. The highest NRR for ear plugs is 34 dB. -Cost less at the beginning. -Don’t have to be cleaned. -They are usually made out of foam, so when inserted it can shape to the size of your ear canal. -Have to keep buying over and over again. -Over the long term this can end up costing more money. -Not good for the environment since it creates more trash. -May get loose and need to be refitted again. -Depending on the design, may require rolling with your fingers before inserting to your ears. -Made out of moldable silicone. – Noise Reduction Rating 33 dB. -The ear plugs are made of a soft foam that sits comfortably in the ear. -Non-Abrasive, Highest-Quality Polyurethane Foam With Very Slow Rebound Time For Easy and Comfortable Fit Every Time! -Try it out for yourself, click here! -Hygienic and Portable. With an aluminum case to carry. 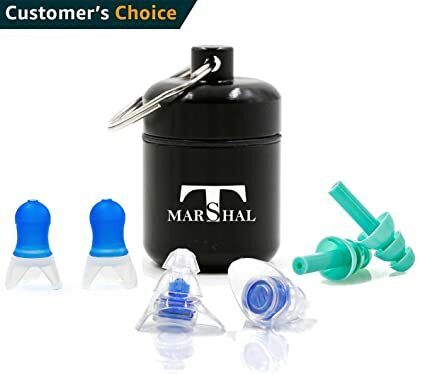 It keeps earplugs clean and away from damage. -Try it out for yourself, click here. -No need to keep buying. -Usually made out silicone which is hypoallergenic. 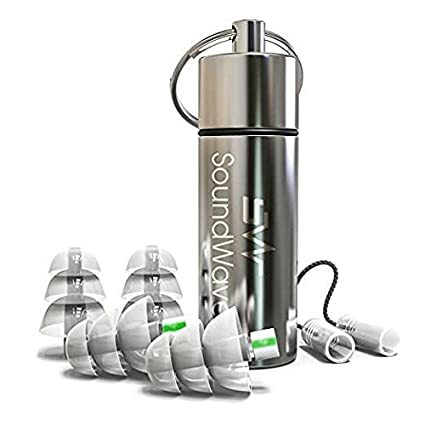 -Can cost more than disposable ear plugs. -Need to be cleaned regularly. -Comes with 2 pairs of corded ear plugs. One pair of NRR 23 and One pair of NRR 27. -Reusable & Washable Hypoallergenic Silicone Rubber Material. -Comes with a lightweight aluminum carrying container which is 2.6 inches tall and 1 inch wide. Small enough to carry on a keychain. 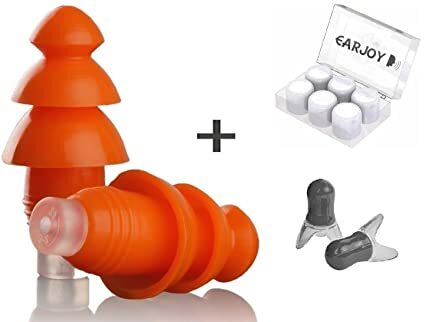 -3 different styles of ear plugs included. 2 of the styles you can insert directly to your ears, 1 pair is moldable. -Blocking high and medium level noise and protecting your peace. -Made out of silicone material. -3 different styles of ear plus are included. Noise Reduction Rating of 21 dB, 25 dB and 26 dB. -Made out of medical soft silicone materials. -Comes with and ergonomic aluminum case, which can be carried on a keychain. -Try them on, check it out here. -2 Pairs with Noise Reduction Rating of 20dB – 25dB . -Comes with 1 Mini Aluminum Carrying Case. -Made out of hypoallergenic silicone rubber. Before buying any ear plugs make sure to read the company’s return policy. Most ear plugs are made to fit the general public. However, in some cases, people may require a smaller or larger size. -Make sure you wash your hands before inserting them in your ears (especially for the foam styles since these require rolling them with your fingers before using them). -If they don’t seem to fit well, try to insert them from a different angle. I remember the foam style that I had years ago required rolling and inserting them in a specific direction, otherwise it would not protect against the noise. -Keep them in an easy to reach place when you sit down to meditate. This comes in handy when you are meditating and everything seems to be kinda quiet, but all of a sudden you start to hear some noises outside in the middle of your meditation. 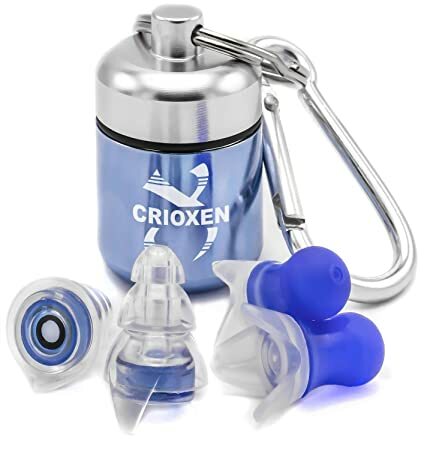 -For your reusable ear plugs, keep them in their container when you are not using them. This keeps them protected from dust and dirt. -Also, If you have any small children or pets, please keep your ear plugs in a hard to reach area, since they could potentially be a chocking hazard. 1. Place your ear plugs in a small bowl filled with water and mild soap. 2. Gently brush them with a tooth brush (make sure to get a new tooth brush since a used one can contain bacteria from your mouth). 4. Gently pat them with a towel and then leave them to air dry in a clean place. 5. Place your ear plugs back in their container. So are you ready now to mediate with less noise? Which type of ear plugs have you used for meditating? I love hearing from you. Please leave me any comments or questions below and I’ll be happy to reply back. This is a really cool review of earplugs. I never realized how many different kinds there actually were. Thank you for sharing this article! I learned a few things about how to have a successful meditating session at home. I may have tried meditating once or twice before, and it is something I definitely want to try again. Now that I’ve read this, I have a better idea of what could help make my next session so much more enjoyable. It can be challenging at first when you are beginning to meditate, since not only are you dealing with the outside noise, but the inside noise can be even louder. At least with the ear plugs, it can help you reduce the outside noise. Then over time you can work on the “inside noise” (constant streams of thoughts). When you are able to quiet down the inside noise, then the outside noise won’t bother you. Some times I hear Fire trucks go by while meditating, I can hear them but I can stay focus. However, this is after many years of practice. If you are beginning then ear plugs can really help you. Hi that was such an in depth review of so many earplugs! Thanks for sharing. Thanks for this interesting post! I imagine that these could also be used to help with sleeping, is that right? Or is there a limit to how long you should leave them in? Do you prefer ear plugs to headphones? I imagined it would have been easier to just chuck some headphones in and put on your favorite relaxation music. Yes, there are some ear plugs that you can use while sleeping. However, there are different styles for different purposes, so if you want them for sleeping you’ll want to make sure that’s what they are.For example, some ear plugs made to protect your ears from heavy construction noise may not be comfortable to use while lying down and pressing your ear against the pillow. Using headphones and listening to your favorite relaxing music is also a choice. However, since there are different styles of meditation, music may not be wanted since you may just want to mediate on the sensation of your breath. So it just depends how you want to mediate at a particular moment. I came to this website looking for ideas for my new meditation practice – but realized that my husband also needs these while he’s drumming! He has disposable ones, but they’re so environmentally unfriendly! I just got a pack of reusable ones, so we both can use them – thanks! I’m happy to hear that you found the perfect ear plugs for you and your husband. That way his ears will be protected while he is drumming and you’ll be able to meditate peacefully as well. I wish you the best of luck in your new meditation practice. Please let me know if there is anything I can do for you to help with your new meditation practice. 🙂 Have a wonderful day.